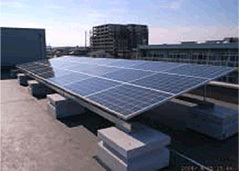 Citizen-initiated Ohisama (“Mister Sun”) Solar Power Station is a solar power generation facility installed at the Kawasaki International Center by the “Citizen-initiated Power Station Project,” which was launched by local citizens working to fight global warming. An outstanding feature of the Citizen-initiated Ohisama Solar Power Station is that the city residents are able to support the generator on their own without any grant from the municipal administration. The “Citizen-initiated Power Station Project” has collected donations from citizens and businesses. They have also received both a grant from the Green Electricity Fund (*1) and were lent funding from ap bank (*2) to establish this facility. It is a strong belief that the Citizen-initiated Ohisama Power Plant is also an effective symbol to promote the dissemination of renewable energy throughout Kawasaki City. It conveys a message to many individuals from foreign nations who visit the facility how local residents are determined to fight global warming. Green Electricity Fund was established to promote dissemination of renewable energy. The fund allocates donations collected from individuals and enterprises that agree with the fund’s policy, as well as donations from Tokyo Electric Power, to create grants for supporting renewable energy facilities, such as solar power and wind power plants. ap bank was founded by music producer Takeshi Kobayashi, Mr. Children’s lead vocalist Kazutoshi Sakurai and music composer Ryuichi Sakamoto. The three started this NPO by contributing seed money from their personal funds. 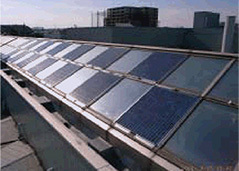 ap bank lends funds for various renewable energy and environmental projects.